At the supermarket last night, I bought date mash bread, which tastes pretty close to banana bread. We tried this at Walmart in the provincial capital a couple of times, but the bread always had pieces of date pits chopped up in there. In order to preserve our molars, we didn’t buy it again. But I took a chance here, and it was all pit-free. Victory! This the only yogurt we’ve found that is as thick as American yogurt. 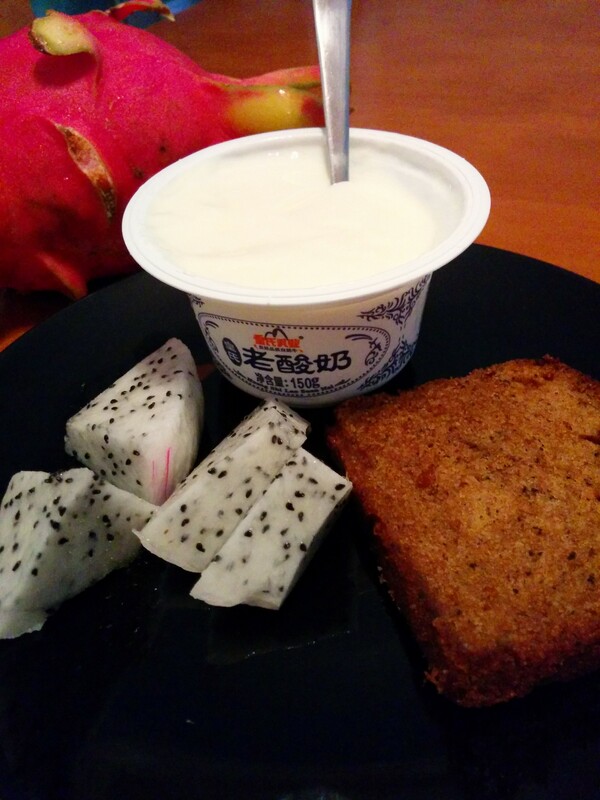 It’s also not as syrupy sweet as most Chinese yogurts. Another victory! Add a little dragon fruit to the mix, and it feels like a continental breakfast. Of sorts. Pork, pork, pork. Yes, it’s time for pork again. Pork is the cheapest meat here, and it’s also the tenderest and tastiest. 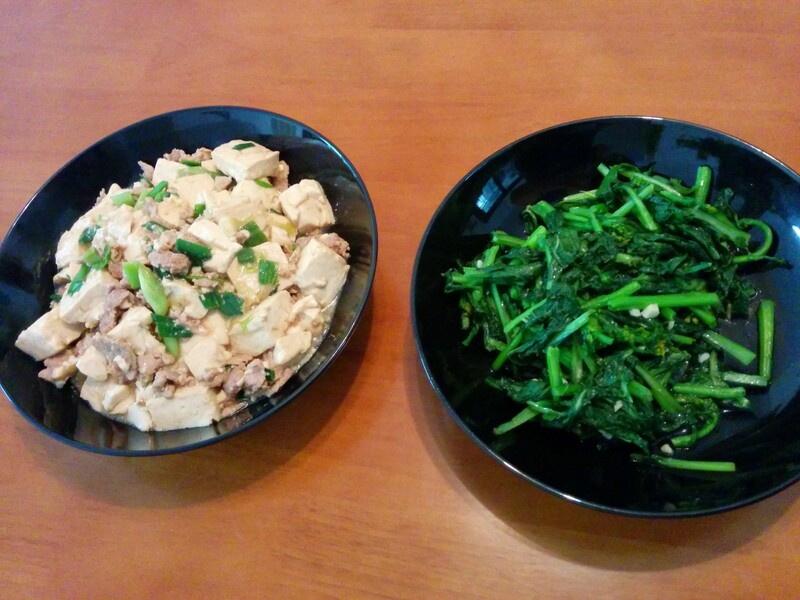 Today the pork was sliced and stir-fried with wo sun, which is something kind of like giant asparagus. Our greens du jour were da bai cai, Napa cabbage. I associate Napa cabbage with winter. It’s usually cheapest and most plentiful then, and it’s also one of the symbols of Chinese New Year. But, hey, I’ll gladly eat it any time of year. Our family loves eating at Ajisen Ramen, but of course, this town is way too small to have an Ajisen restaurant. Thankfully, the supermarket sells Ajisen noodle packs that include fresh wheat noodles and flavoring for their famous bone broth. 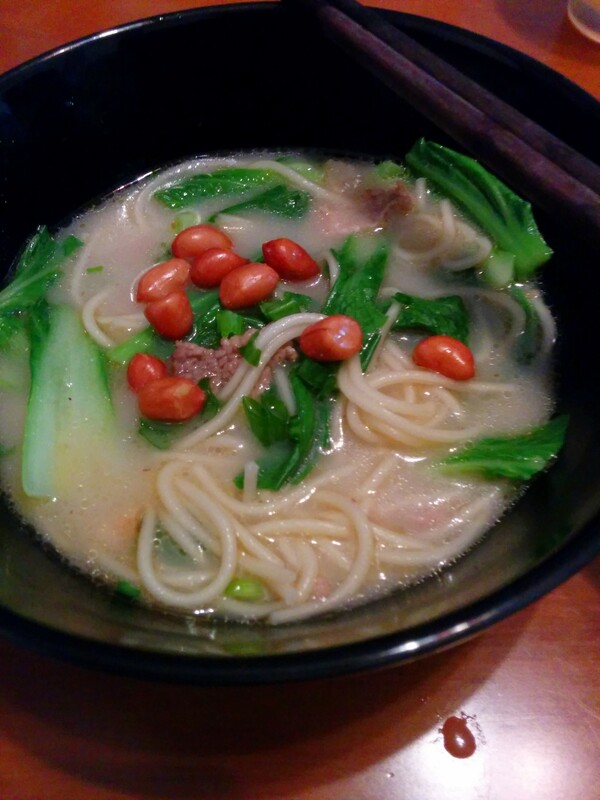 I added a few ingredients to make it more than just noodles and broth. I bought ½ jin of beef (about ½ a pound). Beef has gotten incredibly expensive here, so we don’t eat it often, and it’s best in dishes like this where you’re just looking for a little flavor. I also added a big handful of chopped shanghai qing and green onions, and a drizzle of sesame oil, and a sprinkling of peanuts for crunch. YUM. Keep reading for the hair-raising conclusion on Day 7!